"Men and women who chuck it all to find those castles in the air." 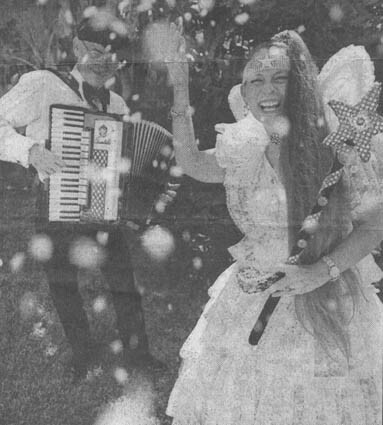 "Wallen Ellingson accompanies his wife, The Truth Fairy, on the accordion. While the Truth Fairy is only "half fairy" (her human half is knows as Gail Ellingson), she and Wallen are both full-time performers, artists and dreamers." "...Then there are dreamers who shun the rat race from the start. Wallen and Gail Ellingson. Wallen and Gail qualify. Wallen, 52, a professional accordion player and bamboo lute musician, has spent his life "following his heart." If you'd like to speak with his wife, look up "Truth Fairy" in the Honolulu white pages. Ask her age and she'll give you the answer in days. "I'm 16,925," she said, which calculates to about 46.5 years in common time. Professionally, the Truth Fairy is a full-time clown who performs at children's parties and any other event that calls for fairy dust. While she sprinkles, Wallen backs her up on the squeeze box. "We live a magical life," said the Truth Fairy, who believes she was born under a lucky star. She admits she was once a photojournalist, which may or may not qualify as fast-track work. Mostly, though, she's spent her working life in the pursuit of spreading peace and joy. "We're not rich, but we make ends meet. We live very simply. We entertain ourselves. We don't own a home, but we're out of debt." Like everyone else in this story, the Ellingsons recommend that others follow their dreams. However, also like all involved, they recommend doing so very carefully - especially if there are kids to consider. And, as Wallen points out, not everyone can or should be a dreamer. "I have respect for the world of 9 to 5," he said. "I've just never been part of it. But let's face it, we depend on that world as much as anything else."